Claus Valca and Lavie Head are part-time couriers, part-time Vanship racers leading normal lives while Anatorey and Disith fight chivalrous battles under the watchful eye of the presiding Guild. That all changes when they meet the young girl Alvis Hamilton, whom they must deliver to the mysterious Silvana. Soon, they find themselves on a journey that will change their world forever. Animated by Studio Gonzo in 2003, Last Exile (ラストエグザイル, rasuto eguzairu) had much of the talent that made the OVA Blue Submarine No. 6. Despite all that, it felt like Last Exile was very much the anti-Blue 6. 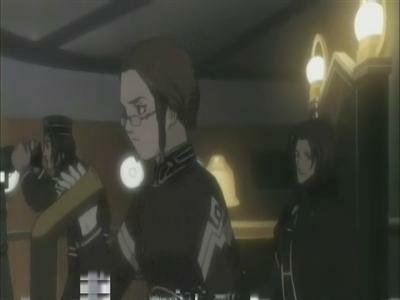 What most people talk about with Last Exile, and I’ll have to agree with, is the animation. It is simply the best-looking anime I have seen that was meant to televised. Last Exile is largely focused on the flight of Vanships, or fighters with really short wings. To show these flight sequences, a heavy amount of CG was used, and I have to say that computer graphics looked fantastic. The traditional animation also looked awesome, with great-looking character models moving nice and naturally. Add the fact that you have oodles of atmosphere, and you have a real treat for the eyes. Kurau Phantom Memory came out the following year, but Last Exile’s visuals are a full head and shoulders better. Last Exile also sounded as good as it looked as it featured a gorgeous soundtrack with Hitomi’s “Over the Sky” as the end theme. I have to say that Last Exile had one of the best soundtracks I have heard. Unfortunately, the writing in Last Exile was pretty disappointing, particularly with regard to developing the relationships between characters. I swear that Last Exile hinted at a romance springing up between Claus and no less than THREE of Silvana’s female crew members, only nothing really got followed up on. Last Exile was handed off to a different writer and director each episode, and it really showed in the shear inconsistency of the story. The issue really seemed to arise toward the end. I have to reiterate that the animation was gorgeous, hence expensive. Thus, it is well within the realm of possibility that Last Exile was originally supposed to be longer, but had to cut the series short when funding began to run dry. Judging by how rushed the ending felt, I think Last Exile could have benefited from about another dozen episodes to allow more (and better) character development. The voice actors (especially Asano Mayumi as Claus) did the best they could to save the weak writing, and ultimately Alex Row, the captain of Silvana, was the only character I found myself giving a damn about. I said that Last Exile is the anti-Blue Submarine No. 6. Blue 6 had unimpressive visuals, but it had an absolutely fantastic story, where not a second if its four (yes, only four) episodes were wasted. On the other hand, Last Exile is a visual and acoustic masterpiece, but was hampered by a weak storyline where I found myself scratching my head and saying, “Huh?” multiple times. The part that hurts me to say is that Last Exile very much could have been a great anime if only it followed what series like Vision of Escaflowne or Fullmetal Alchemist, or even Blue Submarine No. 6, did with stories and characters.